Out of such ideas and a jumble of kindred ones grew the first quasi-religious elements in human life. With every development of speech it became possible to intensify and develop the tradition of tabus and restraints and ceremonies. There is not a savage or barbaric race today that is not held in a net of such tradition. And with the coming of the primitive herdsman there would be a considerable broadening out of all this sort of practice. Things hitherto unheeded would be found of importance in human affairs. Neolithic man was nomadic in a different spirit from the mere daylight drift after food of the primordial hunter. He was a herdsman upon whose mind a sense of direction and the lie of the land had been forced. He watched his flock by night as well as by day. The sun by day and presently the stars by night helped to guide his migrations; he began to find after many ages that the stars are steadier guides than the sun. He would begin to note particular stars and star groups, and to distinguish any individual thing was, for primitive man, to believe it individualized and personal. He would begin to think of the chief stars as persons, very shining and dignified and trustworthy persons looking at him like bright eyes in the night. His primitive tillage strengthened his sense of the seasons. Particular stars ruled his heavens when seedtime was due. Up to a certain point, a mountain peak or what not, a bright star moved, night after night. It stopped there, and then night after night receded. Surely this was a sign, a silent, marvellous warning to the wise. The beginnings of agriculture, we must remember, were in the sub-tropical zone, or even nearer the equator, where stars of the first magnitude shine with a splendour unknown in more temperate latitudes. 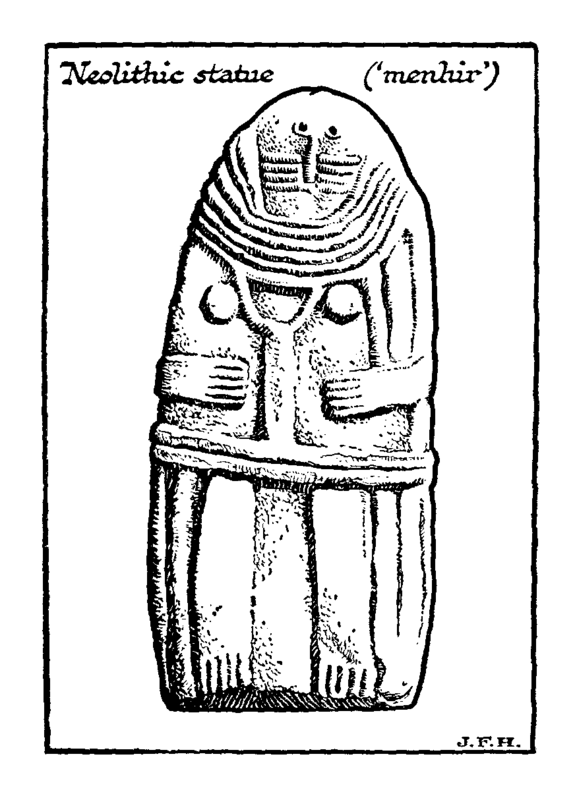 A carved statue (“menhir”) of the Neolithic period — a contrast to the freedom and vigour of Paleolithic art. And Neolithic man was counting, and falling under the spell of numbers. There are savage languages that have no word for any number above five. Some peoples cannot go above two. But Neolithic man in the lands of his origin in Asia, and Africa even more than in Europe was already counting his accumulating possessions. He was beginning to use tallies, and wondering at the triangularity of three and the squareness of four, and why some quantities like twelve were easy to divide in all sorts of ways, and others, like thirteen, impossible. Twelve became a noble, generous, and familiar number to him, and thirteen rather an outcast and disreputable one. Probably man began reckoning time by the clock of the full and new moons. Moonlight is an important thing to herdsmen who no longer merely hunt their herds, but watch and guard them. Moonlight, too, was, perhaps, his time for love-making, as indeed it may have been for primordial man and the ground ape ancestor before him. But from the phases man’s attitude would go on to the greater cycle of the seasons. Primordial man probably only drifted before the winter as the days grew cold. Neolithic man knew surely that the winter would come, and stored his fodder and presently his grain. He had to fix a seedtime, a propitious seedtime, or his sowing was a failure. The earliest recorded reckoning is by moons and by generations of men. The former seems to be the case in the Book of Genesis, where, if one reads the great ages of the patriarchs who lived before the flood as lunar months instead of years, Methuselah and the others are reduced to a credible length of life. But with agriculture began the difficult task of squaring the lunar month with the solar year; a task which has left its scars on our calendar today. Easter shifts uneasily from year to year, to the great discomfort of holiday-makers; it is now inconveniently early and now late in the season because of this ancient reference of time to the moon. And when men began to move with set intention from place to place with their animal and other possessions, then they would begin to develop the idea of other places in which they were not, and to think of what might be in those other places. And in any valley where they lingered for a time, they would, remembering how they got there, ask, “How did this or that other thing get here?” They would begin to wonder what was beyond the mountains, and where the sun went when it set, and what was above the clouds.